Chefs at the Trinity College in Cambridge, England first produced 'Cambridge Burnt Cream' dessert no later than 1630. 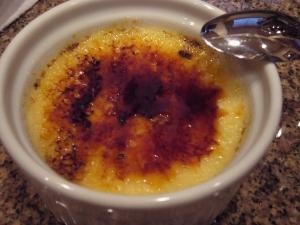 Several country's claim the origin of what is now often referred to as crème brulee, that literally translates to Burnt Cream. Cambridge Cream is often thought to be a French invention, the first written reference to it in France is in François Massialot's 'Le cuisinier royal et bourgeois' of 1691, but it is called 'crème à l'Angloise'. The pudding had been on the menu at Trinity College, Cambridge, for at least 60 years by then. In the 1600's they called it Cambridge cream, Trinity cream or simply Burnt cream. The college in Cambridgeshire even has an iron with the official college crest which is used to burn the sugar topping. Put the cream and vanilla essence in a saucepan and bring to the boil. Meanwhile, beat the egg yolks in a large mixing bowl with 1 tbsp of the sugar until they are thick and pale yellow. Remove the cream from the heat, allow to cool slightly, then pour over the egg yolks in a steady stream, whisking constantly. Transfer this mixture to an ovenproof dish or individual ramekins and bake at 150 °C / 300 °F / Gas 2 for about 30 minutes, until set. Leave to cool and refrigerate for a couple of hours. A couple of hours before serving, preheat the grill to its highest temperature. Sprinkle the remaining sugar over the top of the cream, coating the surface evenly and thickly. Place under the grill as close to the heat as possible and allow the sugar to caramelise to a deep brown. Be careful not to burn it. Allow to cool and serve chilled.